FC Barcelona extended their lead atop of the league standings to 10-point cushion following today’s 4-1 victory over Real Betis courtesy of a brilliant Messi hat-trick which will make his 51st hat-trick one of the most memorable ones. 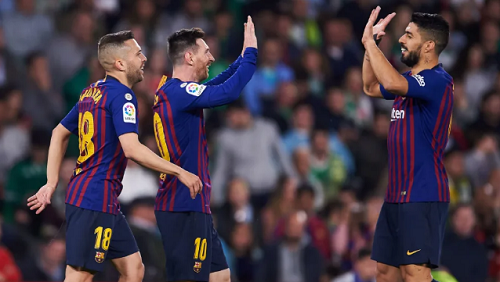 Real Betis were the last team to beat the Blaugrana in the league, with a 4-3 stunning upset at the Camp Nou back in November, and they were the dangerous side in the opening minutes. Messi though delivered the first sucker punch with an amazing curving freekick in the 18th minute. Messi then grabbed his second in stoppage time after Messi played a one-two with Suárez, in which the Uruguayan delivered a clever back-heel pass that set Messi through on goal and get the ball past Betis keeper Lopez for the team’s second goal of the evening. In the second half, Suárez showed some of his old magic when he managed to escape three Betis players before coolly slotting past Lopez to make it 3-1 in the 68th minute. Betis would not walk away empty handed as substitute Loren managed to score a consolation goal in front of the home crowd in the 81st minute. However, Messi would steal the show when he scored from a superb one touch perfect chip that went in off the underside of the bar in the 85th minute. The Betis fans applauded Messi following that goal and Messi showed his appreciation to the crowd. Barça exacted revenge to their loss earlier in the season and now head into the international break with a commanding 10-point lead over second-placed Atletico Madrid, who lost on Saturday to Athletic. The only negative of the evening was the sight of Suárez limping off near the end of the game and the club later said he had suffered a sprained ankle. Barça will return to action on March 30 when they host Espanyol in the Derbi barceloní. Real Betis: Pau López; Sidnei, Bartra, Mandi; Joaquín (Emerson, 67′), Guardado, William Carvalho (Loren, 75′), Tello; Lo Celso (Laínez, 68′), Canales & Jese. Goals: 0-1, Leo Messi (min 17); 0-2, Leo Messi (min 45+1); 0-3, Luis Suárez (min 68); 1-3, Loren (min 81); 1-4, Leo Messi (min 86). Cautions: Guardado 16′; Lenglet 52′ & Semedo 67′. Previous PostBarça demolish Lyon 5-1 to advance to Champions League Quarter-Finals. Next PostBarça victorious in the Derbi barceloní with a 2-0 win over Espanyol.